The 12 minute run is a classic fitness test devised in 1968 by Dr Ken Cooper to measure aerobic fitness. A person simply walks or runs as far as he or she can in 12 minutes and the distance is recorded. The 12 minute run is actually a simple workout that can be used on a regular basis. If you are able to run-you run as many laps as you can on a track or use a treadmill to record the distance you complete in 12 minutes time. If running does not work for you, then walking as far as you can in 12 minutes is also very effective. The key is to push yourself to a point where you feel out of breath and cannot really talk. I have found the 12 minute run to be an effective way to get me on a treadmill lately, as I have needed motivation to get on a treadmill (I much prefer outdoors). 12 minutes is a short enough time to talk yourself into exercising when you may not feel like it. Once you get going, you may feel like competing with yourself to match or surpass your previous distance. The 12 minute run is a great way to watch yourself improve with the distance you can cover in that time. Give this workout a try-you most certainly can find 12 minutes to get active! This is a recipe I came across years ago in Martha Stewart Everyday Food magazine and have adapted to add a bit more zip. This tasty salsa is great with corn chips, as a condiment for grilled pork, chicken, shrimp or rice. The avocado is a healthy fat and the pineapple contains bromelain, a digestive enzyme with anti-inflammatory properties. In a medium bowl, scoop out avocado and mash until it is a smooth consistency. Season avocado with salt to taste. Stir in pineapple and green onion evenly. Stir in cilantro and jalapeno. Enjoy! In a large pot, bring water to a boil and cook the sweet potato until soft. Drain potatoes and put back into the pot. Using an immersion blender, mash sweet potato to desired consistency. Stir in coconut oil, bring back to medium heat and stir in the chopped rapini. Cover and heat until rapini is bright green and cooked through. Heat desired quantity of homemade tomato sauce in a saucepan. Serve the sweet potato and rapini mash topped with the tomato sauce.-Enjoy! Valentine’s Day is the birthday of a special person in my life and I will need to make a cake. Chocolate with chocolate chips is the request. This recipe for a rich, hand mixed chocolate cake is adapted from BiRite Market’s Eat Good Food-wonderful in celebration of Valentine’s Day in addition to any other occasion. Position rack in the center of oven and preheat to 350 degrees. Butter and flour a 10-12 cup Bundt pan, set aside. In a small saucepan, combine the butter, cocoa powder, salt and water. Melt together over medium heat, stir to combine and remove from heat when all is just melted. Set aside. Whisk together flour, sugar and baking soda in a large bowl until blended. Add half of the melted butter mixture and whisk until completely blended (mixture will be very thick). Add the remaining butter mixture and whisk. Add eggs one at a time, and whisk each to blend completely before adding the next. Whisk in the sour cream and vanilla until smooth. Fold in chocolate chips. Pour the mixture into the prepared pan and bake until a toothpick inserted in the centre comes out clean, about 40-45 minutes. Let the cake cool in the pan for 15 minutes and before inverting to a plate to serve and enjoy. 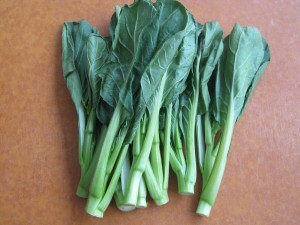 It seems highly appropriate to introduce Choi Sum, a Chinese green vegetable during Chinese New Year. 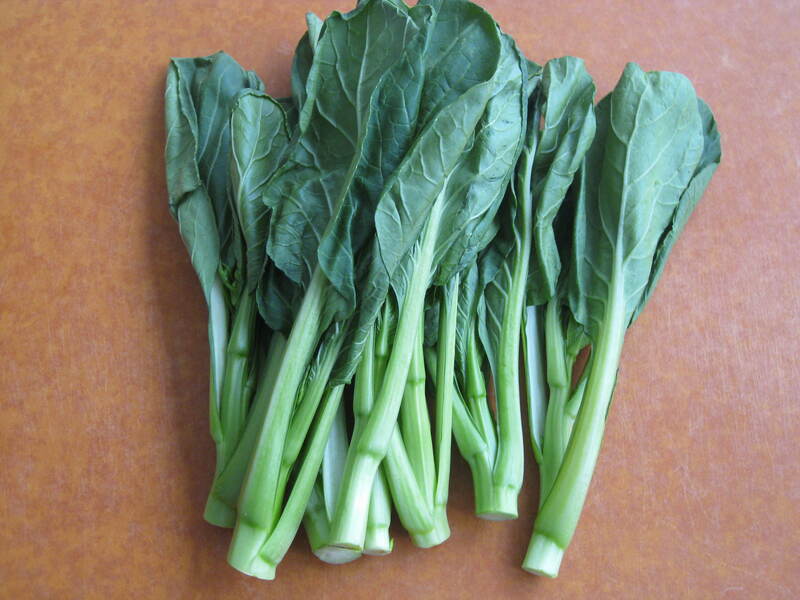 Choi sum is mild in flavour, somewhat similar to bok choy. It is part of the mustard family of greens and is a source of vitamin C, soluble fibre, calcium and phytonutrients such as indole 3-carbinol, which helps cells repair their DNA. Choi sum came to my attention in Hawaii while I sampled the incredibly diverse and blended Asian food on Oahu. I found choi sum as a tasty cold salad at a Korean place in the food court at Ala Moana Mall. I believe the choi sum was steamed and seasoned with sesame oil and soy sauce among other unidentified seasonings to create the ‘salad’. I also enjoyed and ordered extra portions of choi sum in tan tan ramen (a spicy sesame infused broth for ramen and a new favourite food!). With these sources of inspiration, I procured some tender baby choi sum with a little help. It’s an interesting leafy green vegetable to have, which works well for healthy eating and fat loss. Look for baby choi sum, or choi sum that is bright green at your local Asian grocer. Try it stir fried, lightly steamed and enjoyed hot or cold dressed as a ‘salad’, or in a noodle soup. 2. Cook with coconut oil. I use coconut oil in granola, rice, and to cook shrimp. A few recipes are on the website here, please check them out. 3. Treat minor skin conditions by applying coconut oil directly to rashes, dry patches, pimples, cuts, and insect bites. Coconut oil is quickly absorbed and helps speed up healing, as it nourishes the skin. 4. Use coconut oil as an oral rinse to treat oral inflammation like canker sores and irritated gums. Take a tablespoon full, let it melt in your mouth, rinse for a few minutes and expel. 5. Apply coconut oil as a scalp and hair treatment. Coconut oil works very well to ease an itchy scalp. It can also be used as a hair conditioning treatment. I have never liked papaya, until I tried one in Hawaii. 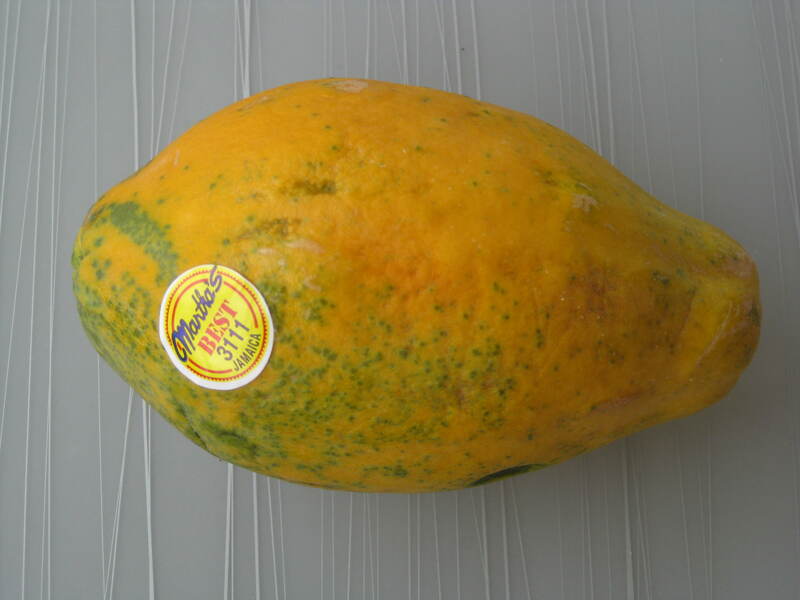 The papaya tastes entirely different there, fresh and sweet with minimal musky flavour. Perhaps it is also the freshness from the crop being grown on the islands. Papaya contains papain, an enzyme that aids in digestion, which helps the body obtain optimal levels of nutrients. Papain is is used as an ingredient in digestive aid/enzyme supplements. Papaya also contains lycopene, lutein, calcium, potassium and arginine. I would suggest consuming fresh papaya for the taste, nutrients and digestive enzymes. The meatless and wheatless tag line caught my attention when I walked through the First Canadian Place underground in December. I bought lunch at Kupfert and Kim this week. I ordered the First Canadian which was quinoa with shredded beets, kale, carrots, cabbage, radish, microgreens, tempeh, sunflower seeds, pomegranate seeds and maple dressing. I used a serving of hot sauce as well for flavour. The First Canadian with its blend of veggies and quinoa makes for a healthy, satisfying vegetarian lunch. 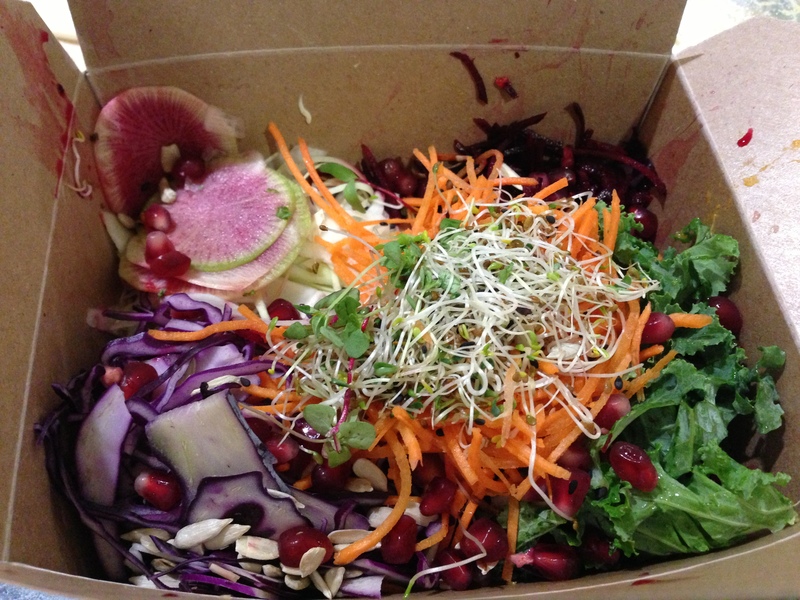 It is a great way to enjoy a variety of veggies for a work day lunch. The dose of veggies is likely to help keep your energy levels up after lunch. The selection of sweets at Kupfert and Kim are good nutritional energy boosters-possible afternoon snacks. The breakfast selections look appealing, as they are breakfasts I would be likely to make and serve to guests myself.